WSJT-X can control your radio directly or through the MacLoggerDX DX Lab Suite Commander TCP server. 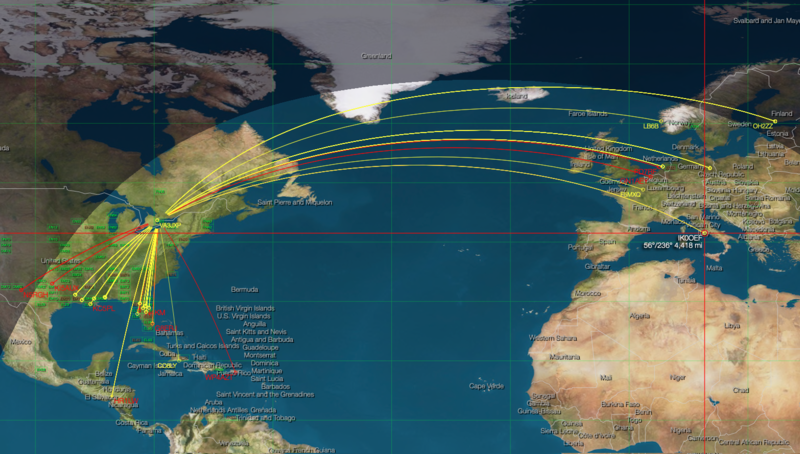 In either case, MacLoggerDX can also log QSOs from WSJT-X, and then optionally upload them to LoTW, eQSL, etc. Note: If you also import logged QSOs from WSJT-X ADIF files or log directly from another program, or have your Mac connected to the LAN with WiFi and Ethernet you may end up with duplicate logged QSOs. MacLoggerDX logs the QSO data that it gets directly from WSJT-X and will automatically Look Up the call in your Call Book to fill in any missing data. MacLoggerDX will look up the WSJT-X DX Call when it changes. Spots are posted to your DXClusters/Spots table (not to the connected dxcluster) for all WSJT-X CQ and heard messages. These spots can be combined with the DXCluster or extra_cluster spots to show you the worked status of the op calling CQ, you can set Alarms for these spots, use DXpedition Tracker, as well as setting Auto Lookup just as you would for dxcluster spots. Monitoring these spots on the MacLoggerDX Map will show you at a glance what the propagation is like as seen by your antenna vs. what the dxclusters are reporting - for this reason we show your call sign as the DX de spotter since your radio heard that end of the exchange. Double-click on the MacLoggerDX CQ spot (CQ in Comments column) to reply in WSJT-X. You can limit the spots to CQ only by checking the Only WSJT CQ Spots check box in the Clusters prefs. Enter your call sign in the Reject Specific Calls Clusters prefs to filter out all of them. To be implemented: Support for js8call. If you let WSJT-X control the radio directly (the spots and logging will still operate), do not connect MacLoggerDX to your radio at the same. 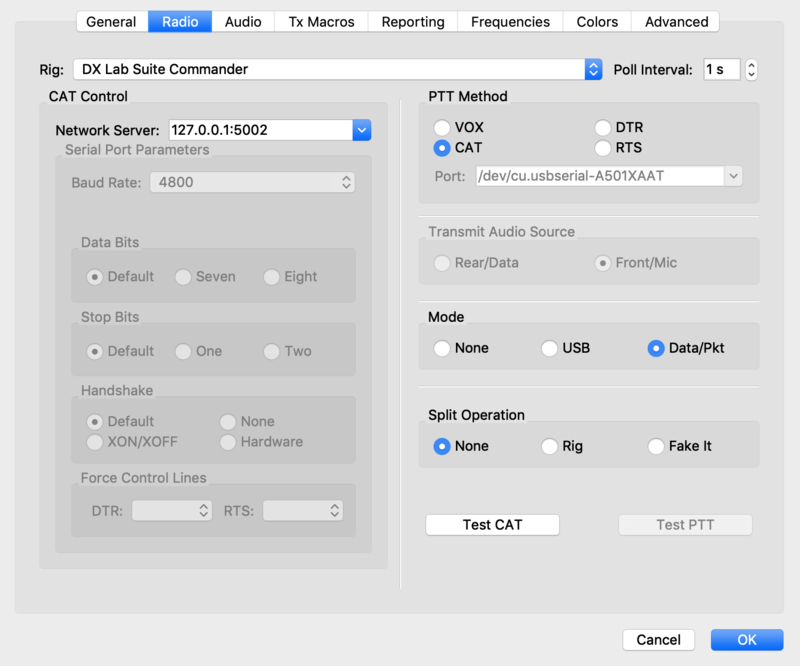 If you want WSJT-X to control the radio through MacLoggerDX select the DX Lab Suite Commander for Rig. Enter 5002 as the default TCP port that MacLoggerDX will listen for client connections on. Make sure the port specified in the WSJT-X Radio / Network Server prefs is the same and restart DXLab TCP in the MacLoggerDX Station prefs. 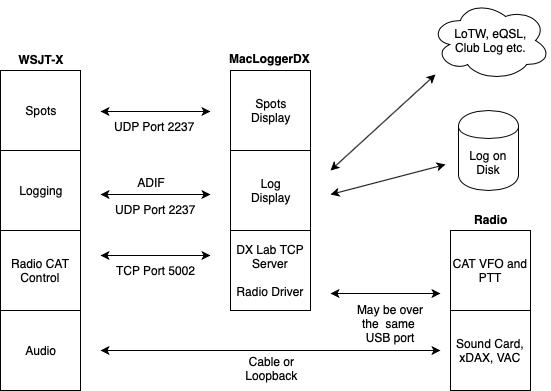 PTT Method can be CAT or VOX. If your radio does not support MacLoggerDX Radio Command PTT and you don't have an interface for DTR/RTS PTT you may be able to use VOX. Mode can be USB or Data/Pkt. Split Operation can be None, Rig or Fake It. Rig is preferred (Some K3 users without 2nd Receivers have had better luck with Fake It than Rig but YMMV). In the WSJT-X Preferences / Reporting tab under the UDP Server section verify that the IP Address is 127.0.0.1 and the Port number is 2237. Multiple WSJT-X instances can send their UDP messages to MacLoggerDX. If they are on different Macs or you have multiple applications receiving WSJT-X UDP broadcasts, use a multicast address: Enter 255 as the last number or octet of this subnet's address - If Macs on this subnet have the address 192.168.1.n, then use 192.168.1.255 to broadcast to all of them. 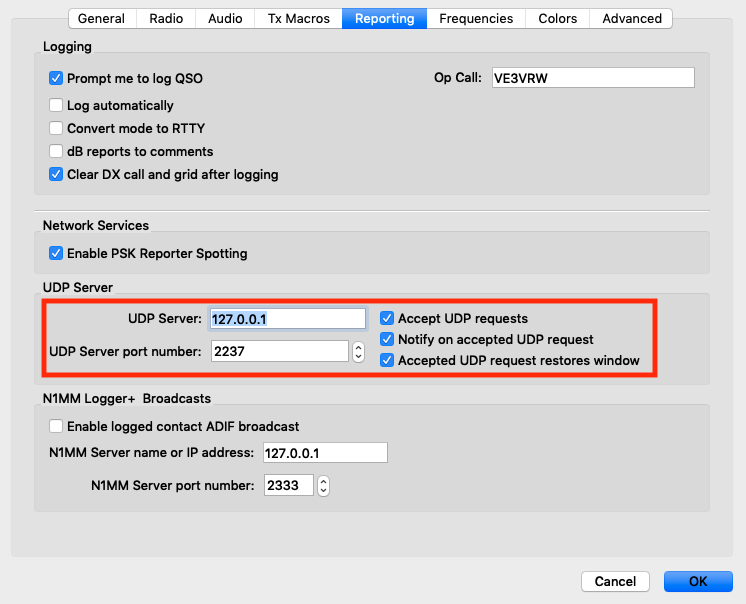 Make sure you aren't running another UDP listener program like JT-Bridge on the same Mac or MacLoggerDX won't get the UDP packets. You can use JT-Bridge or MacLoggerDX WSJT-X UDP decoding - but not both at the same time on the same Mac. Make sure the port specified in the WSJT-X Reporting / UDP Server prefs is the same and restart WSJT-X in the MacLoggerDX Station prefs. In the MacLoggerDX Station prefs, enable the WSJT-X check box to receive CQ and heard spots, the DX Call and logged QSOs from WSJT-X. Enable the DXLab TCP check box to start the TCP Server so that WSJT-X can control the radio connected to MacLoggerDX. The PTT method you have selected in your MacLoggerDX Radio prefs will be used. MacLoggerDX causes the radio to go into transmit but the audio goes directly from WSJT-X to your radio and back. Check the WSJT-X Audio prefs and any relevant settings in your Radio menus, aside from PTT there is nothing in MacLoggerDX that affects modulation levels or signal quality.